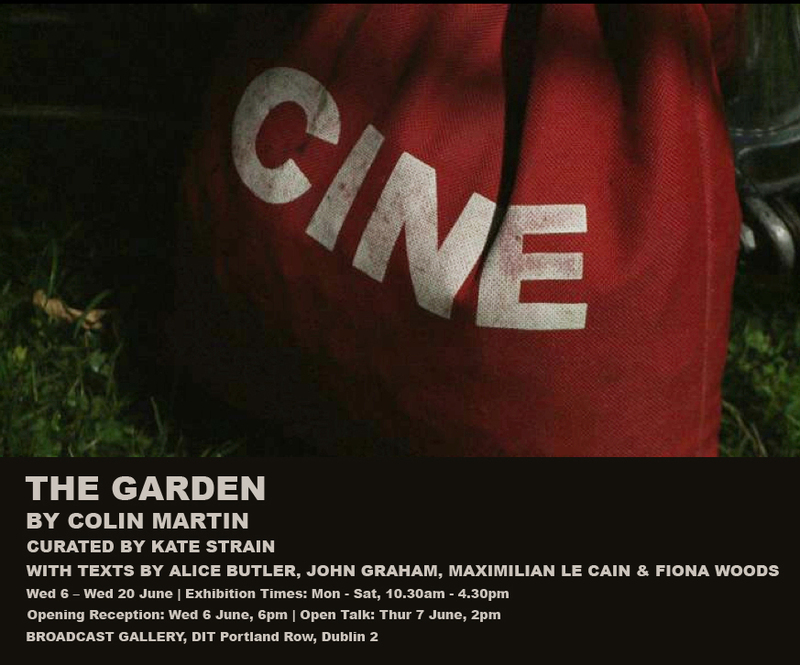 Spectral Range: notes on The Garden and other recent works by Colin Martin. A representation occurs when one thing stands in for another. Whether an arrangement of window boxes or a swathe of roped off countryside, a garden is a representation of nature, a tidied up facsimile of the so-called natural world. Visiting a garden is a bit like visiting a gallery or museum; everything on show reflects the imprimatur of a horticultural or curatorial hand. Gardens and art – the comparisons can be extended – share a tendency to express power (over materials, over domains) and attest our ability to make images we can occupy imaginatively or bodily or both. We like gardens, they adjoin where we live and our earliest memories are often rooted there. They are disciplined nature, and we like a bit of discipline too. Colin Martin’s recent video works are located in two essential movements; slow lateral shifts across zones of precise designation, and a gradual opening to light before returning again to darkness. A third movement, more complex and difficult to pin down, occurs in our own experience of the works, how they act on our corporeal selves, twisting the virtual and the real into ambiguous new formats. Softly guttural like a Belfast Don Corleone, Van’s alternately emphatic and whispering vocal is a hymn to “the youth of eternal summers”, ‘In The Garden’, is also a paean to light, he sings, “… your summery words … ignited me in daylight”. (3) Colin Martin’s garden, like Zumthor’s, is framed in black, not by material but by an absence of light. (4) The surrounding penumbra heightens the drama of the planted areas, its concentration of greenery made vivid by powerful location lamps. Banks of artificial light stand in for Van’s visionary daylight, the artifice completed by the on-screen appearance of the lighting apparatus itself. Devoid of mysticism – artificial lights don’t carry the spiritual cadence of the sun – the garden emerges from sleep, stunned, bleary eyed, coming gradually into view. A prolonged darkness is followed by a prick of light – the moon? – then slowly, as the camera tracks from right to left, we’re introduced to its brightened domain. The tenebrous world identified in Martin’s short films – out of season, behind the scenes, or woken after dark ­– is a world already evoked in much of his earlier work as a painter and printmaker. In these works painted and graphic scenarios are filled with obscuring shadows and un-locatable tensions, a mood of pensive rest between the takes of larger events. Video installations can be tricky for the viewer. We often find ourselves stumbling against each other, groping the walls, waiting for the iris to open just enough to avoid sitting on a strangers lap. This movement, from darkness to light, is a movement expressed in several of Martin’s video works, including The Bridge, and Cyclorama, both 2010. In both of these video works a slow tempo is established. There is a movement from darkness towards light, and towards a conclusion both prefigured and curiously elusive. Standing in a darkened room between the two screens of The Bridge – literally cast at the centre of the action – we watch as the camera approaches from either side of a footbridge. Location lamps powered by a noisy generator illuminate the wooden structure, and as the camera passes from one side to the other the volume increases and falls away. Unmoving between the two screens – we’re fixed in place by sound as much as by image – there is the odd sensation of being relocated. This sense of being caught up in the drama is different to our experience in the cinema where identification exists only in the mind. The Bridge seems to take us across a divide between our physical and psychological selves, and put us back down again at the same place where we started. A feeling of being bound towards the inevitable occurs again in Cyclorama. The camera movement, imperceptible at first, traverses a gloom that reveals itself as a backstage area, the reverse side of the sound stage that gradually fills the screen. Moving in a semi-circle the camera imitates the form of the suspended ‘cyclorama’, a massive curtain backdrop to the empty stage area. Devoid of the painted scenes that normally occupy its surface, the curtain becomes fore-grounded, a fabric normally reserved for illusions, appearing concretely as itself. The journey across the empty stage concludes (if a looped video can be said to conclude) in a re-entry to the darkness behind the scenes. This circling momentum, a kind of suspension in an expanded present, seems suited to the times. The idea of progress, withered in the searchlight of misdemeanor and financial ruin, has lost much of its previous cachet. The march of time (so proudly announced in the newsreel series of that name) has slowed down to a circling shuffle. Martin’s camera movements, their glacial time-code, share a pace with these larger arrangements. Movement though, however paced, is unconditional; things are always on the move. In 24 hour Psycho Douglas Gordon slowed the master of suspense to a quotidian crawl, to ‘death 24 frames a second’ (5). At the conclusion of the shower scene in Hitchcock’s Psycho, water and blood are seen spiraling through the plughole. In Douglas Gordon’s version this ending (for Marion Crane, and of the film’s first act) is extended to several minutes. (6) When time slows down, its tragic aspect seems more acute. Its pace may be diminished, but time, nonetheless, runs out. Through Martin’s ongoing series of works called ‘Basic Spaces’ we gain access to places that are usually hidden. These spaces (a green-screen sound stage, a recycling centre, a pre-election count centre, a state archive) are filmed with a single tracking shot that moves steadily across the chosen location. The camera is an eye without a brain, (in French, the camera lens is an ‘objectiv’) scanning the contents of the ready-made mise-en-scene and revealing in the structure and layout of these functional spaces a kind of underlying syntax of cultural value and control. With points along its axis equally weighted, the scene of a tracking shot has no definitive view. It is an aspect extended in duration, time and the image rolled into one. Brian Henderson describes it thus, “A camera moves slowly, sideways to the scene it is filming. It tracks. But what is the result when its contents are projected on a screen? It is a band or ribbon of reality that slowly unfolds itself. It is a mural or scroll that unrolls before the viewer and rolls up after him.” (7) When this ‘ribbon of reality’ is projected onto a screen, ‘reality’ appears to enter one side as it exits the other; the projected image simultaneously appears and disappears. We rise and go to sleep, our daily round turning within a larger circle. The world appears and disappears on the axis of the earth. In Hegel’s lovely formulation, “… the rising of the sun … designs with one stroke the shape of the new world.” (8) Coming back to The Garden we are introduced to a multiple of viewpoints and a more complex installation than the sparse format of Martin’s earlier works. As the camera moves stealthily across the artificially lit terrain it uncovers a profusion that is normally shrouded. Plants stand to attention under the new scrutiny, and confused moths re-orientate their flight around the 2000-watt moons. The screens of the installation are set up in a four-sided configuration, occupying the four sides of the exhibition space, mimicking the structure of the garden itself, and making it impossible to view everything at once. The stage-bright garden, as it arrives more fully into view, begins to fracture and mutate. Additional screens come to life – a red glow without definition, flowers in close-up, insects at their silent work ­– all combining in a dramaturgy of forms. The apparatus of filming itself, a tri-pod, a camera bag, is joined centre stage by Kinoflos and HMI lamps, sources of illumination as apparent as the world they reveal. Quick-fire editing, close-ups and wider views, come together in projected configurations with a continuing slow tracking shot, the camera moving unwaveringly along its metal rail, apparently indifferent to the chaos building around it. As each screen is illuminated its accompanying soundtrack can be heard, a building cacophony of rattles and hums, the noise from the lights and the generator seeming to mimic the sound – soft wings rapidly flapping – of a film-projector. Sustained in intensity, the crescendo eventually gives way as the camera’s slow passage is completed. Images and sounds withdraw, one by one, and go out. The garden is extinguished in the enveloping darkness. The Serpentine Gallery Pavilion commission (2011) by Peter Zumthor included a planted garden designed by Dutch designer Piet Oudolf. Quoted in the galleries promotional booklet. ‘Death 24x a second’ (2006) is the title of Laura Mulvey’s book reflecting on tensions between the still frame and the moving image, and in particular on how death is inscribed into the stillness at the heart of film.